The artistic property rights law enables artists to protect their works from unauthorized use by others. These rights, in their general sense, are regulations and rules which support representations of creativity and innovation, as well as economic value of artistic works. These regulations consider both economic rights (provisional) and moral rights (permanent). However, despite the applicability of the regulations and the fact that there have been some opportunities to employ them to the benefit of artists in Iran since 1969, indeed their application has remained inefficient and sterile. It seems that there is not only little knowledge about artistic property rights in the field of art, but also not enough decisiveness among executive bodies in the country. This event aims at presenting a report of the current situation while trying to find preliminary answers to the whys and wherefores of this situation with the help of artists. 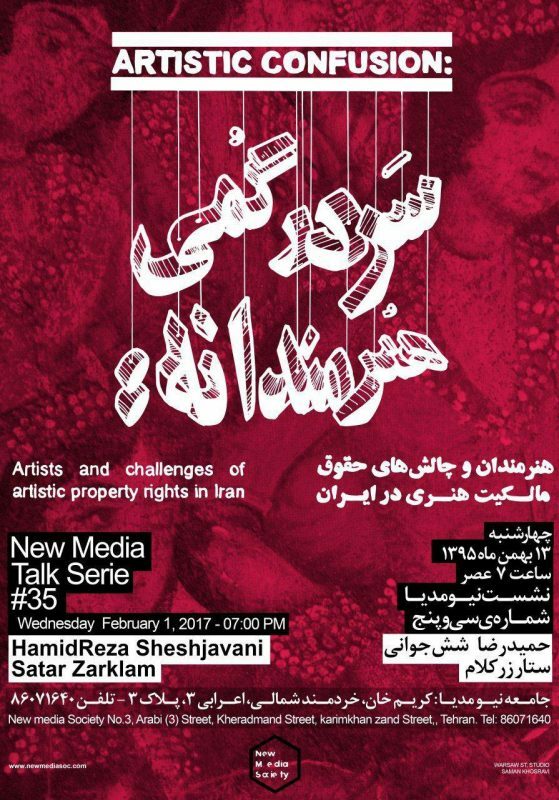 At the beginning, Hamidreza Sheshjavani will present a research-based report about the current condition of artistic property rights in Iran which has been done during September 2016 to January 2017. Then, in the presence of Satar Zarkalam, an intellectual property right expert, we will have a group discussion about artist’s rights necessities and challenges and meanwhile needed terms for just execution of rights. Hamidreza Sheshjavani was born in 1975 and studied Art Economics in Netherlands. He is university lecturer and one of the founders of Art Economy major in Iran universities. He tried to set the pattern for art economy literature by translating fundamental books. “why are artists poor?”, “contemporary art economics” and “cultural entrepreneurship and economic development” are some of them. He also writes essays on art publications. Dr. Satar Zarkalam was born in 1958. He studied private law in France and is teaching intellectual property law in Iran universities. Zarkalam has published some books including “Literary and Artistic Property Law” and “Intellectual Property Law in France and Germany”. He has also published some articles with this content such as “Making clear the concept of originality in literary and artistic works” and “Common characteristics of contracts connected with transfer of intellectual property rights”. “Artistic property right, A manual for artist” is an ongoing project under Hamidreza Sheshjavani’s supervision in collaboration with Aroosha Moshtaghizadeh and Alborz Baghipour. The aim of the project is to inform artists about their basic legal rights. This talk is resulted by the first phase of this project.